Columbia had no answers for Harvard point guard Bryce Aiken (44 points). 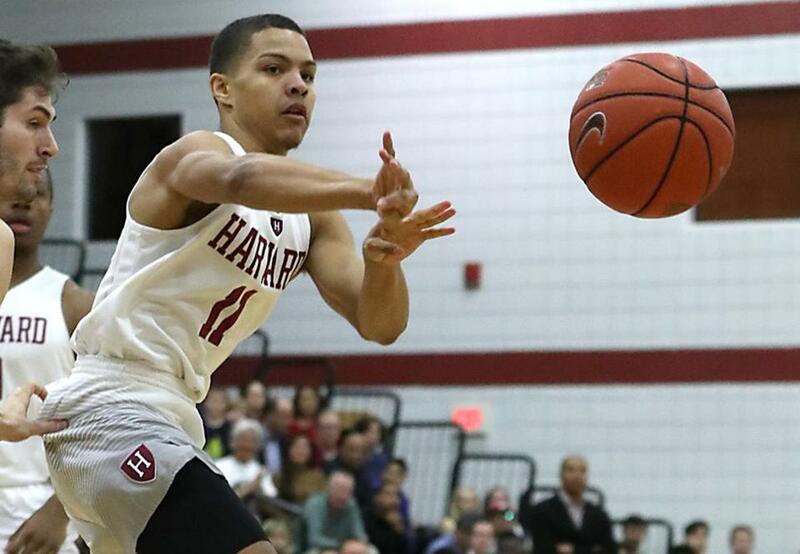 Junior Bryce Aiken scored 44 points — 1 point shy of Harvard’s single-game record — as the Crimson topped Columbia, 98-96, in three overtimes on Friday night at Lavietes Pavilion. Aiken scored 20 of his 44 points across the three overtime periods, including all 12 Harvard points in the first overtime and the team’s for 6 of the second OT. With the win, Harvard improved to 11-7 (4-1 Ivy) and will host Cornell on Saturday night. Columbia, which had three players top 20 points, fell to 6-13 (1-4 Ivy). Harvard’s record for points in a game is 45, which was scored by Brady Merchant in a 93-80 loss to visiting Brown on March 8, 2003. Aiken was 12 for 28 from the field (4 for 10 from 3-point land), but sank 16 of his 18 free throws. Junior Justin Bassey tallied his second double-double of the season with 17 points and 10 rebounds, while classmate Christian Juzang added 14 points. Junior Robert Baker did a little bit of everything, with 6 points, 12 rebounds, 5 blocks, and 4 steals. The Crimson jumped to a 59-50 lead in the second half on back-to-back baskets by Juzang, but the Lions answered back with an 11-0 run to take the lead. Aiken and Baker gave Harvard a 3-point advantage in the closing seconds after an elbow jumper and a pair of foul shots, but Columbia’s Gabe Stefanini (26 points) hit a fadeaway 3-pointer at the buzzer to send the game to overtime, tied at 69. Aiken hit a 3-pointer at the buzzer to send the game to a second overtime. Noah Kirkwood’s 3-pointer in the third overtime gave the Crimson a 96-93 lead with 1:08 to play. Aiken iced the contest with two free throws with 15 seconds to go. Baker blocked a corner 3 by Stefanini, but Quinton Adlesh got the ball and was fouled with 0.5 seconds left while shooting a 3-pointer. Adlesh was short with the first free throw, sealing the outcome. The triple-overtime game was Harvard’s first since playing William & Mary on Nov. 15, 2009, which Jeremy Lin won with a buzzer beater. It was the first know triple-overtime game in Columbia history. The Crimson have won 16 straight overtime games, and is 17-3 in OT games under head coach Tommy Amaker. Adlesh, who scored 24 points, set a school record by playing 52 minutes. Patrick Tapé posted a career-best 22 points on 8-of-9 shooting and 12 boards.